Thank you to these donors to the Our Grand Legacy Memorial Stadium Campaign. Each Thursday we will share more donor names. This historic project will provide Grand Island with the capacity to host state athletic competitions, band competitions, youth soccer and football tournaments, as well as giving Grand Island an additional home for community-wide events. These events will bring visitor dollars to our local economy. The time is now! Opportunities of this scope and magnitude do not come along often. Our history shows that our community rises to the challenge. 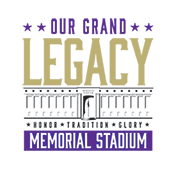 The Memorial Stadium Campaign is an opportunity for you to honor past tradition while leaving a lasting legacy to impact generations to come.